Lords a larky, I go away for a weekend and my blog comments section is simmering away like a debate in a medium-heat Tefal saucepan. Fair do's to all. I'll stand back from the debate (for now!) other than to say I had a great weekend and managed to do more than I had in ages. 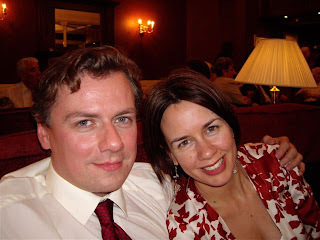 Witness photo evidence of myself and Nice Man at the delightful wedding of Gaelic singer, Julie Fowlis ('it's great, but I have no idea what she's on about - Ricky Gervais). By the way, Julie will appear on the Jools Holland show next weekend. The reception took place in this Victorian hotel in the Highland town of Strathpeffer. One of the pipers told us that Gaelic has far more words for shades of greens and blues than English. He told us it is rich and sensual in descriptions of nature. In the church people sang Amazing Grace in Gaelic and it sounded just as spine-tingly as it always does. And when the sky turned inky blue - or however the Gaels would paint it - there were Gay Gordons and Strip the Willows till the wee hours. This was a very sweet photograph. Just dropping by. Random blogger.